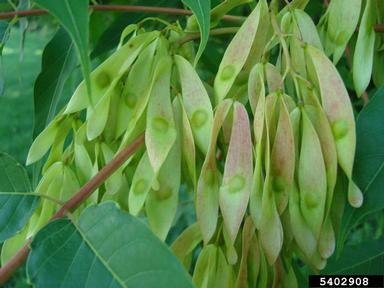 Habit: Deciduous tree to 30 m (98 ft) in height. Reproduction: By seed and vegetatively via root sucker­ing. Leaves: Pinnately compound to 1 m (3 ft) in length with 11-41 leaflets, each with a ‘thumb’ or lobe at the base; leaflet teeth have glands. Stems: Bark gray and smooth; younger twigs covered with a light brown to reddish brown pubescence; thick or chubby tips; may grow up to 2 m (61⁄2 ft) in one season. Flowers: Dioecious; hermaphrodites exist; bloom June to July; may flower as early as 6 weeks after germination; typically insect pollinated by a variety of pollinators, including bees. Fruits/Seeds: Two-winged samara (180º) with one central seed; sets late summer; over 300,000 seeds per tree documented; seeds may remain on the tree through winter; wind dispersed; cold stratification not required for germination; seed bank formation thought unlikely, though found as part of an urban forest seed bank. Habitat: Native to China; several introductions into the U.S. since 1784; found in poor and rich soil on steep and shallow slopes, urban areas, open fields and woodlands, and closed canopy forests; often associated with disturbed habitats; USDA hardiness zones 4-8. Comments: Extensive cloning; at least 5 cultivars; crushed leaves, stems, and roots smell of rancid peanut butter; allelopathic properties present, though negative effects may be less severe if previously exposed; tolerant of several air pollutants; seedlings are drought resistant; quassinoid compounds may deter some insect herbivory and frugivory, but seeds and tissue may be preyed upon by deer, mice, and voles, even preferen­tially in the case of some invertebrates. 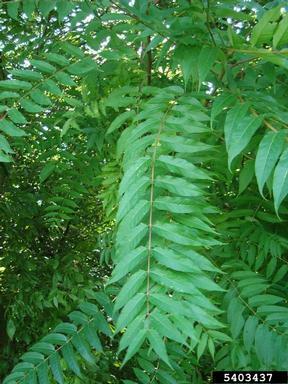 Similar Native Species: Sumacs (Rhus glabra, R. typhina); walnuts (Juglans nigra, J. cinerea); none of the crushed leaves or broken stems of these have the same odor; fruits not samaras.